Home to the delicious Hot Brown, The Brown Hotel features exceptional dining and entertaining at the AAA Four Diamond English Grill, the casual J. Graham’s Café, and the lively Lobby Bar. The hotel offers two Chef’s Table for a unique and delectable dining experience. Consistently honored as one of Louisville's best restaurants, the English Grill serves a contemporary American menu with a Kentucky twist. The dark oak paneling, lead glass windows, tracery ceilings, and equestrian paintings lends to the distinguished and lavish ambiance. An essential destination for visitors and locals, countless birthdays, anniversaries, and special occasions have been celebrated at this fine dining establishment. A private dining room, that accommodates up to 40 guests, is available for rehearsal dinners, parties, and business dinners. The English Grill also hosts special events featuring winemakers and visiting chefs throughout the year. 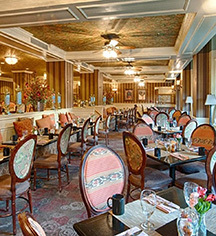 Led by Executive Chef Joshua Bettis, the menu features the traditional Hot Brown, and succulent dishes such as the fava bean and capriole goat cheese ravioli, seared scallop benedict, Kentucky proud Wagyu Angus filet, pan seared breast of Muscovy duck, and diver scallop & lobster Coquille St. Jacques. Save room for the Chocolate Striptease, a signature dessert finished with flaming Bacardi 151 Rum. An extensive list of over 300 wines, with suggested pairings from the sommelier, completes the meal. 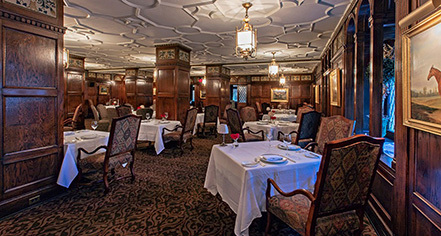 Characterized as the 'epitome of luxurious' by The Courier-Journal and the 2015 OpenTable Diners’ Choice Winner, the AAA Four Diamond English Grill is a Louisville dining experience not to be missed. Reservations are recommended and the restaurant is nonsmoking. Business casual attire is highly encouraged and cell phone use is not permitted. The English Grill is open Monday through Thursday, from 6:00 p.m. until 9:00 p.m., and on Friday and Saturday, from 5:00 p.m. until 10:00 p.m. The English Grill is closed on Sunday. Valet parking is complimentary when dining at the restaurant. The Classic and the Theater Chef’s Tables are two distinct ways for diners to enjoy a behind-the-scene view of the English Grill’s kitchen, while enjoying a scrumptious meal. The Chef’s Table is the ultimate dining experience, tasting new and creative dishes, fit for celebrating birthdays, anniversaries, special occasions, and for adventurous foodies. The seven-course Classic Chef’s Table can accommodate four to eight guests, and has been honored by Forbes Traveler as a Top 10 Chef’s Table experience. The prix fixe includes wine pairings from the English Grill's sommelier. It is a once-in-a-lifetime experience that connects diners with The Brown Hotel’s stellar culinary team. The formal meal is set in the restaurant’s kitchen, where diners can enjoy conversation with the executive chef and tour the kitchen to see meals being prepared. The Theater Chef’s Table is a cooking school-style event for up to 30 guests. Taking place on the working side of the kitchen, the event incorporates the concept of small-plate dining, with four distinct beverage pairings - a bourbon cocktail, red and white wine, and a sparkling wine for dessert. Please reserve 48 hours in advance. J. Graham's Café is a casual dining bistro and home of the legendary Hot Brown. Open for breakfast and lunch, the café serves a contemporary à la carte menu, and from Tuesday to Friday a buffet of gourmet soups, salads, antipasto, hot entrees, and desserts. A Sunday brunch buffet is served from 9:00 a.m. until 2:00 p.m., with an extravagant feast of smoked salmon, scrambled eggs, the Hot Brown Casserole, and more. J. Graham’s Café is open daily from 7:00 a.m. until 3:00 p.m. Valet parking is complimentary while dining at the café. A Louisville destination to unwind and socialize, The Brown Hotel’s Lobby Bar is a gorgeous meeting place with an Old World opulence and bewitching ambiance. Kentucky, rich in the history and tradition of bourbon, produces 95% of the world’s supply. Bourbon was declared by Congress as “America's Official Native Spirit” in 1964 and is celebrated at the Lobby Bar. As a proud and founding member of the Urban Bourbon Trail, a collection of bars and restaurants that know and appreciate bourbon, the Lobby Bar features bourbon flights and cocktails like Ali’s Smash and Kentucky Cider. A casual menu is available, including the famous Hot Brown, lobster “mac and cheese,” steak au poivre, and the menu at the English Grill. The Lobby Bar is open daily from 3:00 p.m. until 1:30 a.m.